astro.CAMPhw is held at Huntley Wood in Staffordshire. Huntley Wood is a 170 acre regenerated former quarry, with open grassland, woodland and lakes. Although in the centre of the country, with easy road and rail connections, the high quarry walls shield the centre of Huntley Wood from the worst of the local light pollution, giving a surprisingly good view of the sky on a clear night. Accommodation at Huntley Wood is camping, so bring your tent! A camping pitch for Friday and Saturday nights, and use of the washrooms, is included in your astro.CAMPhw ticket. For those who don't have thier own tent, but are keen to enjoy the great outdoors, we can offer hire of tents which are erected for you - see the booking page for more information. Or if you don't fancy camping, but want to come along anyway, there are plenty of nearby hotels, B&Bs and other accommodation. 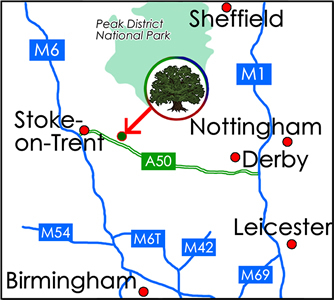 For an additional fee you can also stay at Huntley Wood on Sunday night, which may be of interest to those who wish to combine astro.CAMPhw with a visit to local attractions such as Alton Towers, just 7 miles away, the Potteries, or the Staffordshire and Derbyshire Peak District. Certain parts of the facilities at Huntley Wood are still under construction so, where necessary, the built facilities will be supplemented with high quality mobile toilets and showers - check back here for more details nearer to the time. For more information about Huntley Wood, please visit huntleywood.co.uk which also has detailed directions and more information about local amenities, which includes a map showing the location of nearby shops, restaruants and hotels/B&Bs. You can also follow Huntley Wood on facebook or twitter.